Up until now, the Docker architectures for Magento 2 we have been discussing, were concerned with production servers environments. Goes by its name, production servers are architectured for long term use and are highly complexed. But what if we want temporary mortal servers? Such as we often need Test/Dev servers to replicate the production environment to test our applications. Also, sometimes we have to test different environments for our applications by changing one or two variables. So, bottom line is that we do not want to indulge in time taking process of server setups and their termination. Here comes our today’s topic in play. In this blog, we will discuss to launch Magento 2.2 store within minutes using Docker containers. We created a Docker Image with Apache2 server, Mysql Server 5.7 and PHP 7.0 for Magento 2.2.1 having Ubuntu 16.04 as OS. For our instant server setup, we will use this image to run containers on our host. To begin with, please make sure that you have Docker install on your Ubuntu 16.04. 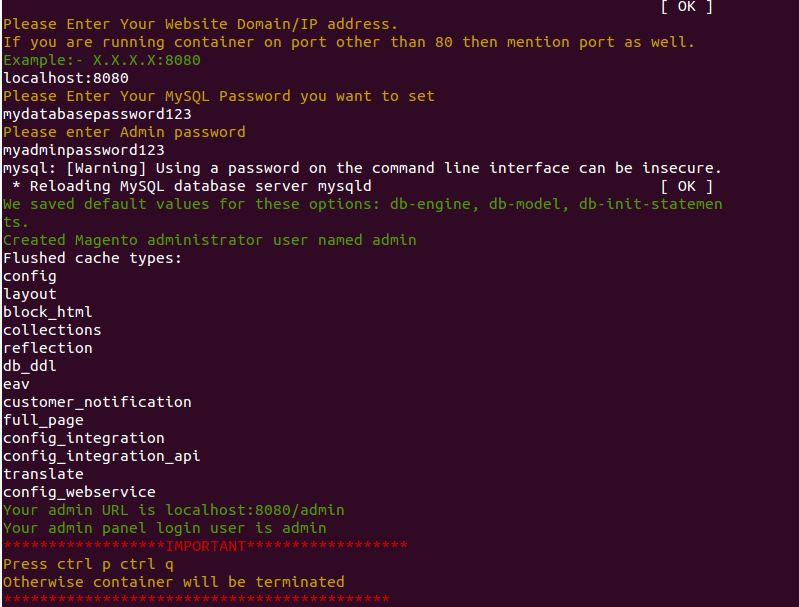 If not please follow, docker installation steps. You will see your admin URL and admin panel login user. IMPORTANT:- Also, remember to press “ctrl p ctrl q” before exiting the container. It is done to put container in detached mode. It is highly recommended to press ctrl p ctrl q, otherwise container will be stopped. You will see all the running containers. Now check your Magento 2.2.1 store by browsing to your domain. To launch another container with same port or different port. Furthermore, you can check the Docker image on docker hub https://hub.docker.com/r/webkul/magento2.2.1/. Try to explore more and more within Docker containers. If you have issues, share your enthusiasm with us.